We’d love to meet you! Come in, take a price list, or Make an Appointment! Walk-ins are always welcome, however appointments are recommended to avoid disappointment. Do you have OPI, CND, and SNS polishes? Yes! We have almost every colour available in the OPI and Vinylux range. We also stock SNS, and the unique Morgan Taylor range! What products are used for Spray Tans and Waxing? We exclusively use Tuscan Tan in our Spray Tanning room, Caronlab waxes for Women’s and Men’s Waxing. The girls at Allure once again are friendly and funny. Today it’s a French Manicure and a nice change from red! Tammy and all the girls are so lovely, talented and always accommodating. Love to be able to support local businesses and a local mum! Just had my nails done. Fantastic job! Fantastic service! Beautiful shop! Will be back. Highly recommended. …or find us on Google Maps below! Give us a ring any time. For other questions or enquiries, please send us an email. 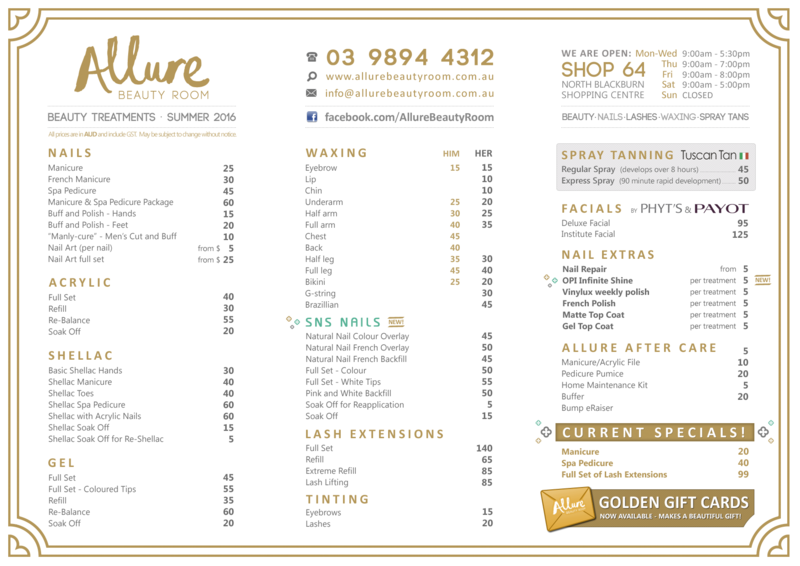 © 2019 Allure Beauty Room. All Rights Reserved.